One reason I have delayed posting the next part in the Gervais Principle series is that as expectations have grown, I have gotten more wary about shooting from the hip. Especially because the remaining ideas in the hopper (there’s enough for two more posts before I call the main series complete) will likely be even more controversial than the first two. So one of the things I have been doing is testing the foundations laid in the first two posts more rigorously. So here goes, a (very pictorial) survey of the ancestry of the MacLeod hierarchy and the Gervais Principle. This is not Part III. It is another side trip. Not many new ideas here, but genealogy should prove interesting for at least some of you. A sense of history is a necessary (though unfortunately not sufficient) requirement for effective sociopathy. For those who came in late, this post will make no sense to you. Read The Gervais Principle and The Gervais Principle II before you tackle this one. First, I need to draw a more detailed version of the original cartoon by Hugh MacLeod, one that captures the Gervais Principle itself, which I only described with words before. Here are two views of the complete picture. The first, the dynamics view, shows the 3 behaviors: checking out, overperformance and Machiavellian scheming, that animate the hierarchy and create its people flows. It pained me to have to mess with the elegant simplicity of Hugh’s original, but too many people were getting confused about what exactly I meant, and we need this detailed view to do the genealogy. This is way too mechanistic for my tastes, but is the best I could do for now (I was trying to draw it using a volcano metaphor, but got nowhere). The important structural elements to note are the three ways out of the entry lobby at the lowest level, of which two have filters/gatekeeper mechanisms. Machiavellian scheming takes you straight up the pipe, and if you sweet-talk the bouncers and get past the velvet rope, you are in. The second filter is the Gate of “Come hang out with us.” Aspirants to checked-out loserdom must actually get past the social gatekeepers that control access to the checked-out loser groups that make life at the bottom bearable. In a very explicit example, Andy is kept out of the “finer things club” run by Pam, Oscar and Toby (an adult version of a new kid in a school trying to join the ‘cool kids’ table, then the ‘geek kids’ table, and being rejected by both, having to eat alone). An everyday example is the New Guy being invited to join the regular evening beer session. The only path that does not contain a gatekeeper is the Employee of the Month funnel. Mere record-setting overperformance — something within your own control to a large extent — gets you there. That’s why it’s actually lonelier in the middle than at the top. The loneliness of leadership (the top) is not as extreme as the loneliness of clueless middle-management life, rejected by the sociable huddle below you, and by the predatory players above you. And remember, the Sociopaths actually like solitude, while the Clueless yearn for connections that they are denied. So they suffer more. Okay, now that we’ve gotten that clearly reviewed, let’s look at the history. A favorite story at management meetings is that of the three stonecutters who were asked what they were doing. The first replied, “I am making a living.” The second kept on hammering while he said, “I am doing the best job of stonecutting in the entire country.” The third looked up with a visionary gleam in his eyes and said, “I am building a cathedral.” The third man is, of course, the true “manager” [we are more likely to call this person ‘leader’ in 2010 – vgr] The first man knows what he wants to get out of the work and manages to do so. He is likely to give a “fair day’s work for a fair day’s pay.”… It is the second man who is a problem… there is always a danger that the true workman, the true professional, will believe that he is accomplishing something when in effect he is just polishing stones or collecting footnotes. I’ve talked enough about William Whyte, that I can just offer you his ideas in triangular form without further comment. In my Organization Man trail, I haven’t yet gotten to the part in his book where he talks about the “Non-well rounded man,” but I will. Note that Whyte doesn’t talk about the lowest level much because he isn’t interested enough in the Losers to explore their lives in detail (he is actually most interested in the after-work life of the organization man). It is a pity this version of the hierarchy looks so impoverished, because Whyte has some of the deepest, richest things to say about all this. I divide my officers into four classes; the clever, the lazy, the industrious, and the stupid. Most often two of these qualities come together. The officers who are clever and industrious are fitted for the highest staff appointments. Those who are stupid and lazy make up around 90% of every army in the world, and they can be used for routine work. The man who is clever and lazy however is for the very highest command; he has the temperament and nerves to deal with all situations. But whoever is stupid and industrious is a menace and must be removed immediately! So let’s put him on the family tree as well. I have been wary about applying these ideas to the military because you don’t want to mess with even ironic-offensive pigeonholing of the people protecting the democracy we are having fun in. But if the military themselves arrive at the idea through introspection, who am I to object? (besides this quote, there are moments in Band of Brothers, Men Who Stare At Goats and of course, Catch 22, that really get at the military version of all this). The good general though, apparently hadn’t heard of 2×2 diagrams, so his language is a little confused. He actually has 2 axes and 4 quadrants, each defined by a pair. Veblen not only gets that the Sociopaths are in many ways very similar to the checked-out Losers (“lower delinquent class” in his vocabulary) he actually explores the dynamics of exodus (beyond checking out: dropping out) that I haven’t included in my model yet. The problem with dealing with the phenomenology of exit/exodus is that it takes you into full-blown social psychology and sociology within society at large, and I won’t have time to take that on anytime soon. Maybe when I retire. Of all the precursors of the MacLeod hierarchy, Veblen’s is the most complete. He even anticipates evolutionary psychology arguments that can plausibly explain this outcome (he has a fairly robust social-Darwinist model that outlines a decent speculative theory of how the modern leisure class evolved out of “higher barbarian” and “barbarian” classes in earlier societies). Which brings us to the most basic version of the hierarchy of all: the Darwinist one. Predators are sudden and great threats to prey, but parasites are low-level weakening agents that only kill you if their activity goes above a threshold. A potentially hazardous analogy: parasites weaken prey enough for predators to prey on. The clueless make the management of the losers easier for the sociopaths. There are other family tree candidates that I have not verified. Greek mythology (especially the idea of Titans battling the Olympians, and the stories of Icarus and Prometheus) seems to contain several of these themes, but I am not yet ready to venture a mapping. Indian mythology (which I am more familiar with), also maps, but again, not with the clarity I would like. If you can think of any other potential candidates, do post a comment. Curiously, The Lord of the Rings seems to map as well. And to conclude, a connection that surprised me: an earlier version of the triangle in the backyard of my own thinking. 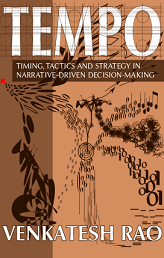 My book-in-progress, about decision-making, Tempo, was initially meant to be a comprehensive treatment of all kinds of decision-making. That turned out to be too much to put into one book, so early on, I partitioned my material into individual and collective decision-making buckets, with the idea that I would put the collective stuff into a sequel. Keeping with the theme of “tempo,” I labeled my folder of notes for the sequel Drummers and Dancers. That has turned into a sort of working title. I know, what am I thinking, right? I haven’t even shipped the first book and I am already planning the sequel. Oh well. Drummers and Dancers was a right-brained working-title choice, and I hadn’t thought deeply about the significance of the phrase. It only struck me about a month ago, reviewing my material, that the organizing theme of Drummers and Dancers is basically another variant of the MacLeod hierarchy. I hope the symbolism is obvious. If not, wait for the book. After I finish Tempo, and if I have the energy to work on the sequel, that will be the book version of this series. I may keep Drummers and Dancers as the title. Sign up for the Tempo mailing list if you haven’t already. To the great delight of us all, you keep drumming! fantastic. What struck me about all these diagrams and the breakdown of their representative systems is the idea of Joseph Campbell’s, the Hero’s Journey. In mythological terms, the hero must make his way through various systems (his journey) to achieve his aim and along the path (and what is a triangle or pyramid but a path with perspective off into the distance?) he’s beset by distractions and obstacles. Hero’s who fail in their quest and give up are the ‘loser’s’, perhaps? Others who heed the call of the Sirens or stay too long in the Land of the Lotus eaters, the clueless? Those who achieve the summit, the Sociopath? But where it gets REALLY interesting is in the collective case where there is no one person who can be identified as the “hero.” This is the monomyth without a hero in it, a very strange landscape. In Tempo, I do the easier analysis of a hero perspective. In D&D, if I get to it, I’ll take on a sort of postmodern monomyth that entirely lacks a hero (tragic or comic). In related news, Steve Blank’s “The Four Steps to the Epiphany” is explicitly modeled on the Hero’s Journey, and is framed as “The Entrepreneur’s Journey.” The book is a must-read for anyone trying to accomplish anything actually substantial in either big or small companies. When you say collective case, I immediately think of a narrative like Pulp Fiction or The Office. Everyone has their favorite character(s) but each contributes to the fabric of the whole system. But then, that’s Life in general, isn’t it. I’m glad you opened up a bit, and fascinated that this theme will be in Tempo. Looking forward to the publication of your book. As an aside, I was able to find and download the first few chapters of Steve Blank’s book. I’ll check it out and hope it motivates me to buy the whole tome. Another great post, your Gervais Principle posts always serve to get me to analyze people I know in my life in terms of the roles they play in the hierarchy. I especially found the military version of the principle interesting, not that I thought the organization would be immune, but that I had not even considered it. The next time I read Catch 22 is going to make for a pretty wild ride I imagine. Today, after reading this post I came across the Bothsidesofthetable Entrepreneurial DNA series (Part 2 – Street Smarts) and I was struck by the quote near the end, “What I explained is that the middle managers at large companies often want to feel like they’re involved with startups and are more approachable than you think.” Would I be wrong in thinking he is basically telling you to speak babytalk to middle managers? This post kind of opened my eyes that the principles are around us a lot more than I originally realized. I kind of feel like now I cannot go back to an ‘ignorance is bliss’ kind of situation and will have to eventually choose between being a checked out loser or a sociopath, as one of the key features of the clueless is well…being clueless. Thanks for another thought-provoking post on the Gervais Principle. One basic analogue of the triangle diagram that occurs to me is the roughly three-tier U.S. class system of lower, middle and upper classes. I’ve been thinking about whether corporations might be structured to reflect wider social status systems and perhaps reinforce them. The U.S. class system has at least one more seemingly significant gradation and that’s the distinction between upper and lower middle class. With this in mind, I wonder if the pyramid might actually have some finer distinctions. Is there an upper-clueless and lower-clueless type? While the Gervais principle matches well with my experience, it seems that there are individuals who are difficult to classify. For example, where I work it seems some sociopathic types get lumped in the middle with the clueless–as they vie for a shot at getting past the velvet rope. Then again, waiting for the rope probably means you’re not really a sociopath. Also, I’ve wondered how these levels might match with the cognitive classes posited in the Bell Curve. Are the sociopaths on the way to the top usually smarter than most of their peers? The Hammerstein-Equord Hierarchy example seems to edge into this territory when he mentions intelligence as a major sorting characteristic. This idea of “smart and lazy” is actually pretty intriguing the more I think about it. What does that reveal about the psychological profile of the top tier? Look forward to reading more on this topic! Re: class in america, I think you’d have to define your terms a lot more carefully. People mean very different things by terms such as ‘upper class’ (do you mean WASPish Boston Brahamins, the real housewives of orange county, or the new ‘black elite’?). The problem is that for America at large, there is no one hierarchy that rules the rest. I’d say there are about 4-5 class systems, largely organized by geography (DC-political, NY-financial, LA-entertainment, Boston-old-money…) and status in one doesn’t translate to status in another. Plus there are lots of subcultures and niches with their own hierarchies. Sandra Tsing Loh had a very thoughtful piece in the Atlantic a while back, Class Dismissed that provides a pretty decent modern survey. Class in America has evolved a lot since the novels of Edith Wharton and the work of Veblen at the turn of the last century. The traditional aspirational class, the Boston-old-money type, despite still controlling a lot of money, is increasingly viewed as decrepit, in a sense, by the noveau riche who no longer aspire to join/rise in that hierarchy. Re: the Bell Curve, I haven’t read that book, but intelligence is only one variable among the many that operate in the broader society, unlike the insides of corporations, where fewer variables are significant. Meritocracy/intelligence only plays a small role in broader social hierarchies, where privilege, fame and hereditary entitlement still matter a lot more than people think. Or to put it in a simpler way, Paris Hilton would be toast if she tried to swim with the sharks inside any modern corporation unless her social status mattered to that particular business. Is it correct to say that the GP applies to hierarchies, of which corporations are an example, and thus it applies to any structure that can be viewed as hierarchical such as class, ecosystems, ect? No, I wouldn’t go that far because it is obviously not true. I’d say 2 conditions are necessary. First, the system has to be relatively closed, without significant in/out movement at any level compared to internal movement. Second, internal movement has to be possible, which is often impossible, as with social class. Even those two are just necessary. Not sure that they are sufficient. I’d like to join the chorus encouraging you to continue with this theme (or perhaps it is by now a project). Thanks for more of this. I was greatly inspired by your last post on this and had a go at writing an essay for the first time in a decade. It came out more as a jumble of thoughts, though I did cover the Hammerstein-Equord Grid, and how it suggests a fourth class, which I called the Loser Sociopath. ; those who have sociopath tendencies, but without the ability to play the game. Those are the people who tend towards exodus (or at least initiate them) as drifters, or work as loners removing themselves from the organisational structure. There’s definitely lots more that could be written about this. I’ve been rewatching The Wire recently, and there’s a gold mine of stuff in there, particularly as The Wire is all about different organisations and the way they operate and interact. Just found this http://flatfingers-theory.blogspot.com/2005/01/styles-of-play-full-chart.html , wich is Yet Another Hierarchy with an appeal of his own. The matrix coming out of the Hammerstein-Equord Hierarchy is actually identical to the so called Performace/Potential-matrix (low and high performance X low and high potential – just google it) that is immensly popular among HR departments of large corporations. They use this matrix to define “Talent” as those with high performance and high potential. These so called talents are then sent to development programs etc. In the Hammerstein-Equord Hierarchy one with high performance (industrous) and high potential (clever) would actually make the “high staff” i.e. the clueless. Which actually fits perfectly with the overall theory. It makes perfect sense that the sociopaths would have corporate “talent” development programs that grow the clueless even more clueless. A great speculative fiction (sci-fi) story related to ‘The Red Queen’ is Maul, by Tricia Sullivan. The velben triangle reminds me of Conan! You’ve talked about the dangers of a craft or tradition that is separate from the “grooming to be sociopaths”, and I’d like to twist that around, just as you shifted around the “sociopathic” tradition. As well as trying to manage and motivate the people bellow, and invest them in the organisation as an end in itself (ie try to get them to treat the preservation of organisational structure as something of paramount importance), they also preserve the memory of the structure. In other words, with their keen focus on “this is how we do it around here”, they provide the persistence people need to keep records etc, and basically stabilise the control processes and build up a battery of standard responses. Now if you can work out how this could be a good thing, you’ll realise that this component of the clueless is a function better done by a computer, or rather by computers and a small group of programmers. As a daft contracted metaphor; the clueless is a FAQ. ACS: Yes, I’ve seen the performance/potential matrix. You underestimate the sociopaths who designed that model though. The overt structure looks like a clueless-manufacturing assembly line, but there is an undocumented shadow function of formal ‘development’ programs that allows it to also function as a sociopath pipeline. I won’t comment more in public. Josh W. : Your observation about organizational memory is accurate, but more complex than I think you realize, once you take into account M&A and creative-destructive aspects. The complexity has to do with the fact that through the turmoil in the economy, professional silos tend to stay intact, and that silos tend to be affiliated with guild-like structures. So the org memory is often generalized and stored in the form of guild memory. That’s the reason I didn’t include it in my analysis, because it widens the scope to the whole economy. This also implies that you can’t replace the apparent ‘memory chip’ people with computers as easily as you think. But there IS an example which illustrates your kind of more ‘pure memory’ dynamics, except that it isn’t in corporations. It is universities serving as the memories of entire civilizations. It is no accident that guilds are often the bridge between corporate and academic worlds (think IEEE). So your first-order model holds if company=entire civilization, clueless layer = academia. But even this is an approximation because the modern university, unlike the medieval one, has a sociopathic (research) function, not just a preservation function. The purest example is religious-academic memory. Long after the invention of writing, and up to the modern day, religious scholars are expected to learn their core texts by heart, chapter and verse. This is because only once in a long time is one of them (often a mystic) able to push through a sociopath-agenda of creating a new, unorthodox reading of the texts. The rest are just, as you say, recording devices. But they cannot be replaced by computers for a variety of other reasons too messy to get into here… maybe down the road if/when I write about guilds. Yeah, I know I simplified, I cut out all the cybernetics because I couldn’t express it cleanly! “Stabalising control processes” is a vestige of a whole other line of analysis about trust vs flexibility. However the extra moving parts you mention are things I hadn’t considered, I was aware of the idea “memory is not an advantage if change renders it irrelevent”, but I hadn’t considered mergers and aquisitions at all. Hmm. I wouldn’t quite agree with your categorisation of the scholastics; I’d say it was more a really strong case of the anxiety of infuence, similar to how a thousand different chinese martial arts are all really showing the “essence” of an ancient teacher! I just read parts 1 and 2 of the Gervais Principle and this genealogy. This is really great stuff. I wonder if you have read Fukuyama’s The End of History and the Last Man. Today, it’s sort of dismissed as neocon justification for spreading our version of democracy by any means necessary and for just being plain wrong. Putting all that aside, however, there are parts where Fukuyama borrows heavily from Hegel, Nietcszche and a guy named Kojeve, and makes some pretty interesting points about the evolution of society. He talks about how the origins of the nobility lay in the warrior class; those who weren’t afraid to risk their lives fighting. Fukuyama seems to posit the liberal democracy as the ultimate historical form of society because it minimizes the number of sociopaths and losers and invest mosts of us in some form of cluless participation. I was reminded of this when i saw your diagram of the different stages that organizations go through. I wonder if you can say the same about societies, in which case Fukuyama is only half-right in that this process is somewhat natural, but also wrong in that it’s not the end. Rather, it’s the point at which things start to fall apart because everyone is comfortably vested in the status quo and there’s not enough people with the will to make the tough decisions that keep things growing at a sustainable pace. The analogy is sloppy, but it’s really the first time I have ever thouht to make the comparison. I also noticed that you make no explicit use of the concept of risk-aversion, but it seems quite present when you talk about the difference between Ryan and Michael. The former being not very risk averse, while the latter is quite so. Yup, I’ve read End of History and am quite a fan, as you might expect. It does get sold short because of the neocon associations. As the aforementioned Flatfingers (thanks for the cite, Rodrigo! ), I should note that the model I’ve put together of four playstyles in the computer gaming context are explicitly not a hierarchy. The four styles (which I consider to be four gameplay-context subsets of the four “temperaments” described by David Keirsey) are co-equal in value — they’re not behaviors, they’re motivations, and as such none is more “advanced” than another. Furthermore, I don’t see people changing their innate motivations at all. So I don’t think my player/personality types model is analogous to the hierarchical models that Venkat is exploring in the Gervais Chronicles. Having said that my model is not hierarchical, however, I have to point out that Richard Bartle — the man behind the four original Bartle Types used to describe the preferred playstyles of computer gamers — believes that there *is* a specific hierarchy among the playstyles. In fact, when he extended his original four-type system to eight, he was able develop a specific graph showing his impression of the path by which a person changes from one type of player to another. You can read his thoughts on this at his working site: http://www.mud.co.uk/richard/selfware.htm . Perhaps more usefully, I’d like to mention one of the greatest works of organizational analysis I’ve ever seen: The Evolution of Civilizations by the late Georgetown professor Carroll Quigley. If you go Googling Quigley, you’ll run into his Rhodes/CFR/Trilateral Commission stuff that the black-helicopter crowd gets excited about; that’s not relevant here. What The Evolution of Civilizations points out is that where Spengler and Toynbee saw civilizations going inexorably from birth to maturity to death, Quigley recognized that while civilizations are always headed toward failure, it’s not inevitable — there are a couple of ways to reverse course away from extinction and to restart the engine of growth. There are two key elements to Quigley’s thoughts on this process. First, he posits that civilizations enter a period of growth when they develop an “instrument of expansion.” An instrument of expansion generates a surplus for some people which they then reinvest into the civilization for additional invention. 1. The civilization reforms the broken institution by making it an instrument again (reapplying the surplus to invention). 2. The civilization circumvents the broken institution by creating a new instrument of expansion, leaving the visible perks of the institution to its owners. 3. The civilization preserves the broken institution, achieves a brief Golden Age by eating its seed corn, then is destroyed and consumed by other civilizations with their own functional instruments of expansion. I mention all this because I think what Quigley was really onto was not just civilizations, but organizations generally. This goes back to what Venkat discussed in the “From the Whyte School to The Gervais Principle” section in Gervais 1: when organizations grow too disconnected from reality (i.e., an instrument of expansion becomes institutionalized), they are torn apart by other organizations that are in a growth mode (Schumpeter’s “creative destruction”). In MacLeodian terms, Organizational death comes when there are so many Clueless surrounding the decision-making Sociopaths that reality no longer plays a role in how the organization adapts to the external world of customers and competitors. (I like to call this the “Reality Distortion Field” effect — organizational size tends to be proportional to RDF levels.) The Losers can see reality because they are least insulated by it, but they are also least able to change the organization to respond to changes in that reality. And the Clueless care only about maintaining the Organization as it currently exists. Finally, as someone who actually functions in a large organization (and I don’t know whether I’m a Loser or one of the Clueless! 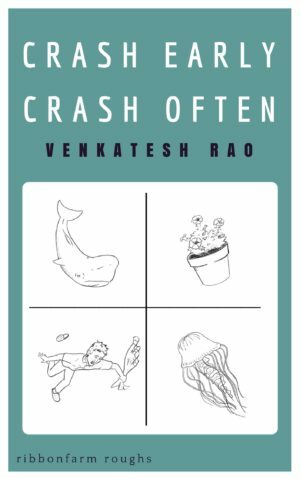 ), I have to say that this entire series by Venkat is remarkably pessimistic and cynical given that organizations sometimes actually do work. Real things that real people really do want, which would be impossible without some form of human organization of planning and labor, actually do get created. Shouldn’t a completely mature theory of the organization, with all its flaws, explain its capacity for success as well? That said… this whole series so far has been one of the most fascinating things I’ve ever read on the haphazard collection of ones and zeros that is the Internet. Nicely done, Venkat! Kiersey scales on a completely different dimension , as does the strengths scale . Even a 2×2 matrix like compliant/aggressive x conforming/non-conforming doesn’t map well to Kiersey. Quigley has a lot to say about the arbitrariness of scale and dimension in social science, but he was also operating in a far more intellectually naive culture, particularly regarding linguistics and data visualization. Which is not to fault his 3-choice model – I think that’s at least functionally sound if not necessarily theoretically sound. Any structure that works in pushing the “muck” of situational complexity an roughness downwards, or conversely, in pushing luxury and freedom to the top, weakens the feedback loop between the organisation’s decision-making and it’s actual interactions with the environment. They just don’t find out when stuff is stupid because the clueless are blocking the channels for that stuff to get up, even as they expect the losers to deal with it. The promotion of new sociopaths allows “obvious stupidity” from the lower levels to be dealt with where decisions are being made: In their promotion they carry the information up with them. This allows the organisation to have some self-reforming capacity even if the individual members do not have, because they can get moved out the way by new people with new ideas. But that puts a limit on the speed of organisational flexibility; the speed of promotion/restructuring. I suppose that is partly where you’re mergers and acquisitions come in Venkat; moving the people around allows the insights they have gained in the loser position to get put into practice. It also shuffles old sociopaths down into loser in new organisations, where they try to bounce back up for the same reasons. I suspect as always there is more to it than that! Now what about the system-building, problem solving types? I mean it makes sense for them to be at the top of the organisation doesn’t it? Maybe, but that’s no guarantee that’s where they’ll end up! I think this structuring principle is accurate for many corporations, but it is not the only one. The leisure class societies had their priests, their royal alchemists philosophers or poets, basically those who acted as a combined foil and component part of the leisure class. In a similar vein, I think in this model the idealists, and archtects can be found at any point in the organisation, depending on whether they match up to the current sociopathic alliances, whether they have been able to preserve mystique around their functions (in terms of external confusion/respect vs internal smugness), or are treated as replaceable components, etc etc. The org can already work without them being in the right place, because of the agent based learning it does, but it gets occasional boosts when they get into where they should be, and they actually get proper incentives to do work for the company (levels of power/remuneration or clueless “incentives” that they actually want). Just found this blog and am enjoying it immensely – you think good. Within a public drum circle you’ll see the sociopaths, clueless, and losers. Let 20 percussionists come together and jam – 2 to 4 of them, typically, are controlling the energy and beat. The others either entrain to it (clueless), or drop out/irritate the others (losers). The sociopaths communicate with each other non-verbally, and usually make acknowledgment eye contact at least once. They have the beat, and they “throw” the lead to each other in the same way NBA players throw no-look passes on a fast break. When a clueless tries to lead, or a loser, they tend to stop playing, the dancers leave, the energy goes down, and then they restart. It’s incredibly elitist in that sense, because they are the only ones who get it among the percussionists. I’ve shifted terminology from “drummer” to “percussionist” to make a point. I can walk into any open drum circle, determine quickly who is actually “running” it, and join them – with only claves. I’m lazy, and an actual drum is too much work :) While the clueless have their Big Drums and way too much busyness, I can mold the rhythm with only a few beats – or one – per measure. The same dynamic applies among the dancers. Frequently the “lead dancers” – the ones who dance when no one else is – will move in the circle to be in the best position to respond to the lead percussionists. They’re the ones who get watched by the losers, and followed by the clueless. They are *collaborating* in the performance. And they stop dancing when the lead percussionists stop playing. If you’re a lead percussionist, you’ll play with them. It’s all nonverbal, but usually quite conscious. The “wallflowers” are the group best considered losers, in this case, and sociopath/clueless distribute between the dancers and drummers. Thanks for this ntertaining and illuminating comment. My drummer/dancer thinking is probably far too informed by Indian classical music, where drumming is usually a solo act, accompanying dancers. I studied tabla for about 5 years, but never got good enough to take it up seriously. I’ve been to a couple of drumming circles in the US, but I must have some Eric “goddamn hippies” Cartman in me, because I absolutely hated the culture and never went again. Maybe because I am so used to solo drumming. That said, I think the basic metaphor still works… you are either carrying the rhythm, or following it, or are tone-deaf. I’ll just have to make sure I adequately account for the real dynamics in music/drumming/dance performance around the world so the metaphor works for everyone. Or I may drop the metaphor altogether… who knows. This book is just a twinkle in my eye at the moment. Gotta get the first book finished and shipped first. Am enjoying your sidebar discussion, but it is quite obscure to me since I am n0t a gamer. I think the correlation between personality types with gervais principle dynamics is weak to non-existent. I am personally a Keirsey NT, and have seen NTs who have maneuvered into the C-suite, but I’ve seen examples of the other 3 types as well. It depends on context. There is much stronger correlation between Keirsey and professional track though. Whether you rise to CEO via engineering or marketing or sales or HR depends strongly on type, but all those paths are possible. The only connection I’ve been able to develop between GP and personality is more Freudian in spirit than Jungian. I have an S/C/L development theory (or rather arrested development theory) that I am polishing up to post. Finally, re: pessimism, I prefer to call it “cheerfully dystopian.” That said, mood and happiness have nothing to do with valuable production. Slaves built the pyramids and the American cotton-based economy, and I am sure they held a pretty pessimistic worldview while doing it. The organization is this screwed up BECAUSE it needs to actually produce. Organizations that produce nothing are pretty happy places. They’re called parties. I continue to be curious about the “input” area of the GP pyramid. It occurred to me that most of the pyramid diagrams suggest that everyone starts at the bottom. What I was getting at in my previous comments about class and IQ is that we’re all very much pre-sorted before entering a corporate hierarchy. The primary sorting mechanism is the academic credentialing system, which seems to serve as a proxy for at least three factors: IQ (as measured by SAT or other standardized “aptitude” test), social class of parents and also, leadership ability. Harvard, the most prestigious U.S. school, selects for high IQ, and “leadership” ability as demonstrated by high school extracurricular or sports achievement. Clearly, familial status is also a selection factor, as SAT thresholds are bent to accommodate acceptance of legacy students, for example. It seems that a prestigious degree can send a person to the sociopath level of the hierarchy without having to pass any of the lower gates. This could be an efficiency measure, if corporations trust the Ivies to be very successful at identifying the future sociopaths of America. However, the inherited social class element seems to sit uneasily with a pure view of the GP. In any case, the GP lingers in my mind. Looking forward to any upcoming posts you have on the topic. Yes, inherited social class DOES sit uneasily with GP, since GP is fundamentally a meritocratic (though not necessarily moral) model. Inherited status effects always tend to work against social mobility and allow inefficiencies to creep in (I don’t intend to cast any aspersions here, but it is interesting that the current head of Toyota. Akio Toyoda, is the grandson on the founder Sakichi Toyoda. Dynastic effects are also very strong in many American corporations. We also have dynastic effects in U.S. politics, including the presidency. It seems pretty clear that George W. Bush rose far beyond his innate talents due to the lift provided by his family name. That said, he was in all likelihood a pawn for Cheney, who might just turn out to be the greatest sociopath yet known in American history. Perhaps dynastic effects provide even greater opportunity for sociopaths to exploit? Another thought about credentialing through brand-name schools: Is it possible that a sociopathic mindset can be instilled? Do very wealthy people who presumably acquired wealth through sociopathic behavior, teach their children to speak powertalk at a young age? First of all, thanks for the chance of looking at old stuff from new perspective, and new stuff from old perspectives. – Can I be that one is at the same time a sociopath and a clueless depending on how far he/she is from what defines his/her role? – How would sociopaths rewrite the post from their perspective? – where is the Matrix here? because it has to be somewhere, right?